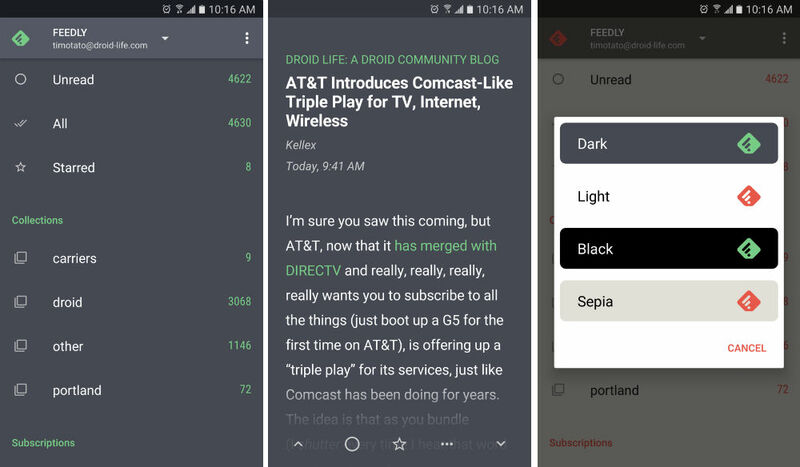 The developer behind Fenix, a very popular 3rd-party Twitter app, released another app to Google Play this week, one which looks to replace your Feedly app. Quote, available for free on Google Play, enhances the Feedly experience with vast sync options, settable themes, and much more. As listed in the app’s description on Google Play, users will have a full screen reading experience, gesture navigation, Readability support, offline caching for images and articles, and a search RSS feature. Additional features can be unlocked via a single IAP, which grants access to an ad-free experience, multiple account support, and additional themes. If you happen to use Feedly, and are familiar with how good Fenix is, then you know what to expect from Quote. Fenix continues to receive timely updates to bring new features, so expect the developer to treat Quote the same. If a RSS reader is how you partake in DL’s content, then by all means, check out Quote.